It sometimes happens that readers of this blog see me point out something interesting-sounding or overlooked about a game, and decide to play it for themselves. If anything in my writing has tempted you to play Heimdall, let me be clear that this is a seriously mediocre game. 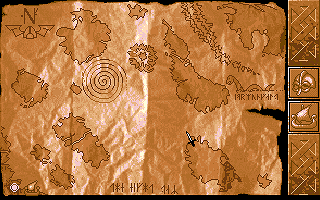 The lack of clear separation between quest-important inventory and ordinary RPG-level objects is just about the only interesting thing about it, the player’s attention is too often focused on coping with the user interface rather than on the game content, and, as foreshadowed by the character generation system, the game’s four main modes (sailing, dungeon exploration, combat, inventory) seem to all have been designed separately, without much consideration towards making a unified whole in either design or functionality. Let’s talk about the inventory interface a bit, because that’s the one mode that I haven’t described in detail. Actually, the game calls it the “options” interface, and it does indeed contain the save/load buttons, but personally, I think of an “options” interface as something external to gameplay, which this definitely is not. So I’ve gotten used to thinking of it as the inventory interface, because that’s what you use it for most of the time. I’ve spent a substantial fraction of my playtime just shuffling loot around among my characters’ limited inventory slots. Most of the scrolls I pick up, I discard after Heimdall identifies them, but before he can do that, he has to have them in his personal inventory, which often requires freeing up an inventory slot taken up by something else he just picked up. Possibly because he’s the one doing the fighting, Heimdall is always the first to pick things up, which means his is the first inventory to get clogged. Money stacks, as do keys (with a separate stack for each key type), so it’s efficient to give each stacking thing to a single person. I decided early on that I’d just keep them all in Heimdall’s inventory, so that they’d automatically stack when he picked them up and minimize the amount of shuffling needed. 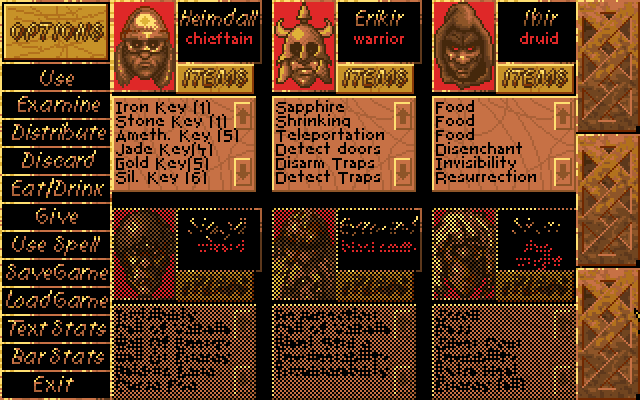 But the number of distinct key types grows over the course of the game, to the point where this approach may be backfiring: Heimdall doesn’t have many inventory slots left precisely because he’s loaded with keys. One big problem the inventory interface has is a lack of feedback. There are no rollover effects of any kind to let you know what’s clickable — no highlighting, no changing text field, not even a change in the shape of the cursor. Perhaps this concept only gained traction with the advent of the web. Since web pages freely mix clickable text links with unclickable text, they have to provide as much feedback as they can, and indeed have provided all three of the mechanisms I just mentioned since day one. And yet, there still exist people who don’t understand hyperlinks, and who never click on a link that doesn’t explicitly say “Click here”. Such a person would be utterly lost in Heimdall. It takes some flailing at the beginning to figure out that the action buttons that require objects (such as “Use”) require the object to already be selected before they’ll do anything, especially since some of them still don’t do anything if applied to the wrong sort of object. It also takes a while to get used to the fact that “Give” is only used to give items to NPCs (an action I’ve only had to perform explicitly once in the entire game so far; usually they ask for what they want and you agree via a confirmation dialog), while swapping items within your party is done with “Distribute”. The worst part is that the parts of the interface that look the most clickable — the word “Options” in the top left and the word “Items” attached to each character — aren’t. They’re on beveled plates that look like buttons, but they’re just title text. This may be a matter of modern expectations coloring things, though. I don’t know when beveling of UI elements was invented, but it certainly didn’t become a prominent part of the user experience until Windows 95. Ultimately, all my complaints come down to the same thing: this is a game that expects you to read the manual in order to learn how to interact with it. This was a much more common assumption in the old days. I remember that time, and it wasn’t a good assumption then either. People have always treated the manual as a device of last resort. It just took the games industry a while to realize this, and to understand that the solution was to accommodate players, not to retrain them. After another lengthy flight, I’ve spent enough time waiting around to be well into the second of Heimdall‘s three chapters. I think I’ve pretty much cracked this game. As is often the case, the initial challenge is simply learning to think the way that the authors want you to think, figuring out what’s expected of you. Although the moment-to-moment details of this game are RPG-like, the larger goals more resemble a rather simple adventure game. 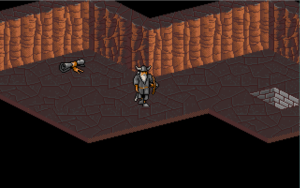 Or, to put it another way, it’s a simple adventure game stretched out with lots of RPG-style padding. But the combination makes things somewhat more difficult than either would be alone. And by that, I mean that there are items with non-obvious uses. Every once in a while, the game throws a quest item at you that you’ll need later in some special circumstance — but it’s not always obvious when this happens. Scrolls generally contain combat spells, but the more unclearly-titled spells have effects on the map level, like revealing secret doors. If I find a scroll of Revelation, I know from earlier experience that this is a part of a puzzle: somewhere, probably nearby, is something important and invisible. If you find, say, a ring, it’s less clear: it has no obvious use in combat (the engine doesn’t even provide a way to equip jewelry), but it might be something than an NPC somewhere wants, or it might just be a treasure that you can sell for food money. The wisest course is to hand it off to someone back on the boat and wait for more information. And that seems to be the key to the game. Don’t use stuff up if you don’t know what it’s for. Mind you, the game can be forgiving even so. At one point, I found a scroll with an offensive spell said to be deadly against giants. I stashed it on the boat, thinking I’d pull it out when I started encountering giants regularly. It turns out that there is one giant, a singular boss monster, which I encountered while the scroll was still in storage. I beat it anyway. Heimdall’s stats are maxed out by now, so special encounters of this sort aren’t the problems they once were. PAX is full of games, but it’s even more full of people. The show was simply oversold. I haven’t even really tried to get into any panels or events other than the IF-related ones, but even those, contrary to expectation, have had queues too long to fit in the room. Are there really that many IF fans at PAX? Not really. At one of the panels, someone asked the audience to raise their hands if they had played a text game in the last year, and only about half of them raised their hands. Even that was more than I was expecting after hearing people talking in line. Some of them had no idea what they were in line for, and just wanted to get into anything. This was a good half hour before the doors were opened. After one such experience, I made sure to bring some entertainment on subsequent queues. This isn’t at all unusual, of course. A lot of people in the queues were playing on various handheld devices (mostly various forms of Nintendo DS). But I’m still trying to get get through Heimdall, which means using a relatively bulky laptop. If I can sit down while playing, I can of course put it on my lap, where it belongs. But the people in charge liked to keep shifting the queue around while we were waiting, to use space more efficiently. Standing up and holding the laptop in one hand, one has only one hand free for gameplay. But you know something? For a primarily mouse-based game like Heimdall, that’s enough. If I weren’t playing Heimdall, I probably would have been trying to play IF, that being more appropriate to my immediate context, and to play that standing up, you’d really want a harness of the sort seen in The Typing of the Dead. Here I am at PAX East, surrounded by games both new and old, PC and console and tabletop. And yet, by my self-imposed rules, I have to focus my attention on Heimdall for long enough to write another blog post, because I played it a bit while waiting in the airport on the way here. It’s one of those moments that makes me ask myself why I’m doing all this. I suppose the traditional “because it’s there” will have to do. The overall goal in Heimdall is to recover three weapons weapons of the gods, stolen and hidden by Loki: Thor’s hammer, Odin’s sword, and Frey’s spear. (The spear is something of a surprise to me, but a quick google turns it up in a few other games, if nowhere else.) The manual also mentions a three-tiered model of the world, with the human world of Midgard sandwiched between Asgard, abode of the gods, and an underworld whose name I don’t recall. (I don’t think the manual used the word “Niflheim”, but Norse mythology seems to have multiple underworlds.) So just from the point of view of symmetry, it seems likely that each weapon is hidden on one of the three worlds. So far, however, I haven’t left Midgard. I think I know where the weapon on this world is, because there’s really only one island left that I haven’t explored thoroughly, and it’s the island that’s reachable last. The ordering of the islands is partial — there cases where you can definitely say “this island comes before that one” and other cases where you can’t. It’s definitely worthwhile to try to clear the islands in the order they become available, though. This was a mistake I made early on: on the first island I visited, a man asked for a sprig of hemlock, and I wandered far and wide looking for such a thing. It turned out to be found on the next island over, which I could have visited first. I just hadn’t explored it fully. A lot of the items that I had found no use for before turn out to be quest tokens for the final island. Those scrolls bearing “runes of power”? If you’ve collected a full set, it lets you skip a fight. Whether it’s a fight worth skipping, I’m not sure. One of the islands exists primarily to provide you with a scroll that instantly kills giant serpents of the sort that guards the waters around the final island, but I managed to kill that serpent with simple melee before I found the scroll. It all really comes down to how much food and healing magic you carry to the final island with you. This stuff has been absurdly abundant throughout the game up to this point, and cheap to buy in stores, but it seems to dry up immediately once you’re on the other side of that giant serpent corpse. So you really want to carry as much as you can. But then, each of those power-rune scrolls takes up an inventory slot each. I’m loath to give up a collection subquest, but surely I’d be better off devoting those slots to food? One of the five basic character stats in Heimdall is “Runelore”. This more or less means magic ability, which is to say, the ability to cast spells from scrolls. But it also means the ability to simply read runes. When you find a scroll, it’s described simply as “Scroll” in your inventory until you have a character examine it, and that character’s Runelore ability determines whether they can read it, identifying the scroll and changing its name in your inventory, or whether you just get shown a string of pixelly, low-res runes. However, even the rune string can ultimately be used to identify the scroll, because the strings are consistent within scroll types, just like the randomized nonsense names in Nethack. Even better: a little observation reveals that the runes are just a substitution cipher. If you show a bunch of scrolls to a low-runelore character before identifying them, you can recover the alphabet pretty efficiently. Even just looking at the ciphertext and treating it like a cryptogram yields good results in my experience. There are, however, runes that are immune to this sort of analysis. I’ve found scrolls that show a single “rune of power” and have no idea what to do with them. Attempting to cast them as spells like the other scrolls does nothing — perhaps they’re quest tokens? Some charms, similarly bearing a single rune each, are even more inscrutable, because I don’t even know what verb to apply to them. (The inventory interface somewhat unnecessarily provides distinct buttons for “Use”, “Use spell”, “Eat/Drink”, “Give”, and various other actions, even though I have yet to find an item that can be used in more than one way. In most cases, picking the wrong verb provides no feedback at all, not even an error dialog.) Perhaps charms are active just by being in your inventory. But if so, I haven’t figured out what their effects are. And in some cases, at least, it really is a matter of figuring things out through careful observation. The one sort of single-rune item I’ve got down is the potions. I really underestimated those at first, thinking they would be like the potions familiar from other RPGs, providing replenishment or temporary buffs. But no, potions in this game grant permanent stat increases. Thus, potions are major finds, and rare. Sometimes a single potion is the ultimate reward for making it all the way through a dungeon. The rarity of potions means that I can’t give them to all of my characters. But that’s okay, because there’s one guy who clearly deserves them the most: Heimdall himself, the god-hero, the game’s central character. Most characters have some kind of focus to their abilities, but Heimdall is the all-rounder, and not one of those almost-as-good-as-the-specialists sorts, but the Robin-Hood-like figure who’s better at everything than all of his underlings. As such, it seems a waste to boost anyone else’s stats. If I give Heimdall a potion that raises his Runelore stat, it improves my party’s ability to cast spells; if I give it to my wizard, the only result is that he can cast spells almost as well as Heimdall. And yeah, Heimdall’s stats depend on your performance in the three minigames back at the beginning, so it’s possible to have a Heimdall who isn’t as powerful as this. But remember, those minigames also govern which other characters are available to you, so it seems likely that the designers have it set up so that you never get characters better than Heimdall in any respect. So I have all these highly skilled specialists on my boat, but unless there’s a bit that actually requires a warrior or a druid or whatever, all I ever do with them is make them carry Heimdall’s stuff. I can only hope that they get invited to Valhalla at the end, even though they haven’t proven their valor on the field of battle, because they really deserve something nice for putting up with all this. I haven’t mentioned this here yet: I will be attending PAX East this weekend. I will probably be spending a lot of my time at the IF Hospitality Suite. Any reader of this blog who is willing to trade pokémon is welcome to find me there. It suddenly strikes me that Heimdall, as an RPG with realtime movement and isometric perspective, could be seen as anticipating Diablo. It took me this long to notice this because it doesn’t play like Diablo at all. Core to Diablo is the lack of separation between exploration and combat: monsters chase you around the map, attacks take place in the same realtime system as movement. That’s not the case here. Exploration is realtime, and combat is realtime, but they’re different realtimes. As in Desktop Dungeons, all encounters are bound to fixed locations, and involve only one enemy. Sometimes you can see the enemy just standing there waiting, usually blocking a passageway. Other times, it’s a surprise: you’re walking down an empty corridor and you’re suddenly told that a monster has snuck up behind you. As with the pit traps, I can’t really see the surprise encounters as helping the game. For one thing, they’re only a surprise the first time, and I’ve been tending to go through a lot of the islands multiple times, due to not having the right keys to get to the best treasures the first time. I may even need to replay from the beginning soon: a possibly-essential item seems to have vanished from my inventory, whether through glitch or careless click. Although you have six characters in your crew, you can only take three of them at a time ashore, and only one at a time can fight. (These vikings clearly get their ideas about battle from kung fu movies.) Combat is mainly a matter of clicking the on-screen “attack” or “defend” buttons at opportune moments. An animated illustration of the enemy takes swings at you and sometimes dodges. You can watch this to time your actions, but frankly, I don’t think I do significantly better by this approach than by just mashing “attack”. But then, sometimes pressing the “attack” button doesn’t do anything. I’m halfway to convincing myself that only the text of the word “attack”, rather than the whole area of the button, is clickable. If true, horrible! I know that my earliest attempts at attacking failed simply because I hadn’t selected a weapon yet. This is something you have to do at the beginning of every fight; the game has no memory of what you’re wielding, and no notion of a default weapon, even if you’re carrying only one. Fortunately, every combat starts with a “Do you want to run away?” prompt that can be answered with a Y or N from the keyboard. This gives me an opportunity to position my mouse over where I know the button for my weapon will appear, so that I can save valuable seconds at the very beginning. And it’s kind of terrible that the game has me thinking like that. 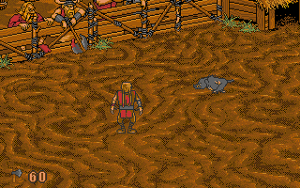 The chief play mode in Heimdall, the one where you spend most of your time, is an isometric view of various rooms and corridors. Sometimes the corridors are decorated to look like roads in the outdoors, and they do a much better job of looking outdoorsy than the wallpaper back in Might and Magic, but they’re still functionally corridors. You make your avatar trudge around in this environment — there’s no “run” button, and walking is slow enough to make me impatient sometimes — picking up treasure, finding keys to unlock doors, and running into monsters and pit traps. The pit traps are the most irritating thing in the game. They don’t kill you, they simply take away a certain amount of health and send you back to a safe position. But they’re unmarked, and usually come without warning — a cheap trick if there ever was one. (When I do manage to anticipate a pit trap, it’s usually because I fell into another one nearby. They hunt in packs.) 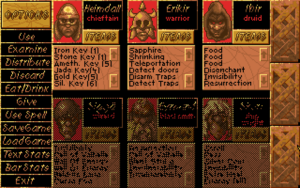 There exists a “detect traps” spell, but casting spells in this game uses up the scrolls they’re written on, so you can’t simply cast “detect traps” in every room — even if you were to find an infinite source of “detect traps” scrolls, you don’t have enough inventory slots to carry as many as you’d need. And anyway, so far it seems like it’s more efficient on the whole to just go around triggering the traps and then eat some food to replenish your health when necessary. This may change over the course of the game, if the traps become deadlier or more numerous, but right now, they’re just an annoying non-challenge. The color scheme of the corridors, as in game as a whole, tends toward brown and grey, with occasional splashes of red or light blue. I’d call it dull and unvaried, but sometimes it seems more like deliberate TRON-like stylization on the palette level: the vikings blend into the stone as if made of the same substance, while the occasional red bits seem all the more significant. (One area has walls that are entirely red, and it seems more special because of it.) I don’t really believe any of this, though. More likely we’re just seeing the artists doing the best they know how with palettized 8-bit color. They know what they can do with shades and tones, but only have room for so many. The earliest games on the Stack, the ones from the 1980s and early 90s, are all RPGs. You might think this means that I’m a big RPG fan, but only if you forget the reason that these games are still on the Stack after all these years: they’re the ones that I haven’t played yet. They’re also not games that I purchased when they were new. Everything I’ve played so far in this chronological run-through has been from various anthology packages, all released around 1998. I’d say Heimdall doesn’t quite qualify as part of this trend, but it’s a judgment call: I bought it, on impulse, as part of a 1995 bargain-bin two-pack re-release that included its sequel, Heimdall II. I understand Heimdall to be a fairly short game, but I was unable to complete it back when I bought it because the graphical effects accompanying spellcasting caused my system to crash. We’ll see if DOSBox does any better. I have reason to be worried already, though: even before I get into the game proper, I’m getting graphical glitches. If I play in fullscreen mode, sometimes it gets into this state where graphics simply don’t show up until the part of the screen they’re on changes. Animation shows, and the non-animated bits of the screen can be revealed by scrubbing over them with the cursor, which could make an interesting game element if it were deliberate, but it’s not. At any rate, it doesn’t seem to happen when run the game in a window, so that’s how I’m going forward. We’ll see if this prevents the game-crashing later on. The initial character creation stage — which only creates the stats for the main hero, not for the rest of the crew (at least not directly) — is particularly notable. In it, you prove your worth for the coming adventure by means of three minigames: throwing axes, fighting on a boat, and catching a greased pig. The notable thing about it is how much programming time must have gone into such a minor part of the game: each of the minigames uses its own mechanics and user interface, takes about a minute to finish, and, as far as I can tell, is used nowhere else in the game. You see it only once unless you start over — which I suppose most players will do, because you’re bound to be disappointed in your first try. But to make the whole thing even more marginal, it’s skippable. You can go directly into the main game with less-than-ideal stats if you want to. For a while, I thought I was going to have to do this, because I thought that the game had frozen up at the start of the greased pig sequence, but when I consulted the manual, it turned out that I had to press the space bar to make it start. (I think I tried every other plausible keystroke.) I’m glad I didn’t have to skip it after all, because in addition to your stats, the minigames also govern who you can put on your crew: there’s a choice of 30 characters, but the more powerful ones turn up their noses at sailing under viking who can’t even catch a pig. Next time I’ll try to describe the main part of the game a little. I’m still getting used to how it all works. I’m several days late now at posting about my initial experiences with the next game on the Stack. I do in fact have experiences to post about, but that’s not what I’m talking about today. Instead, an interlude. 1Literally, something played between I’ve been spending a lot of time this week on Desktop Dungeons, and have a few things to get off my chest before moving on. DD seems to be most commonly described as a “ten-minute Nethack“, but I disagree on both counts. First of all, I find that my typical session takes about a half an hour. At first I thought that I was taking so long because I was unfamiliar with the game mechanics. But honestly, that’s going to be the case in most sessions here, at least if you play it like I do. Completing a session successfully tends to change the game enough that I have to relearn it, whether by unleashing new monsters or map types that require new tactics, or by unlocking new character classes that also require new tactics. And some of those unlockable classes defy anticipation. Yes, you start off with the D&D-standard four choices (fighter, thief, priest, wizard), but then you get a class that specializes in destroying walls, or one that regains health from the bloodsplots left behind when you kill a monster (something that had been purely cosmetic up to that point). It reminds me a lot of the Final Fantasy V “Jobs” system, in that I’m constantly trying out new character abilities without any sense of prolonged commitment. I find there’s not much point in revisiting a class/map combination that I’ve already completed successfully, so I’m pretty much always playing from a new angle. Secondly, the Nethack influence is pretty slim. It’s a dungeon crawl with a randomly-generated map which starts off dark and gets filled in as you explore it. This puts it into the same general category of games as Nethack, but that’s a pretty big category — with just those criteria, we probably haven’t even narrowed it down to roguelikes. A couple of stronger influences are mentioned on the game’s download page: Tower of the Sorcer and Oasis. From Tower of the Sorcerer, we get the stationary monsters and deterministic combat mechanics, also seen in DROD RPG. (Actually, there can be a certain amount of randomness in combat: one of the special abilities of the Rogue class is a random chance of dodging and avoiding a blow completely. But most of the time, it’s deterministic.) This scheme is done in the context of randomized maps rather than authored puzzles here, but it still has the same effect on gameplay: it lets you choose your battles carefully. Also like those other games, the UI provides you with some help: hovering the cursor over a monster gives a report of its stats and what the outcome will be if you hit it — usually “Victory”, “Death”, or “Safe” (which means that neither you nor the monster will die). This is valuable information in special conditions where the math isn’t entirely obvious — for example, when playing a Berserker, you do 30% extra damage when fighting a monster of a nominally greater experience level than your character, but it’s not obvious how that fraction gets rounded, and a single point can make the difference between victory and defeat, so it’s good that the UI confirms this. It would be nice if it went further, though: the hover text only covers the next blow, and doesn’t cover things like the fireballs you plan on throwing in beforehand (and which you don’t want to waste if they’re not going to do enough damage). So I still spent a lot of the game doing mental arithmetic. Oasis provided some basic overall inspiration for the game: it occupies a similar niche, being the “ten-minute Civilization“. It also clearly inspired the mechanics behind exploring the dungeon. To start with, movement is instantaneous — it’s exploration that takes time. You move to a spot simply by clicking on it, and if you don’t reveal any new territory in the process, no time passes. Mind you, “time” means something different here than in Oasis. Oasis had a limit on the number of turns you could take, and repositioning yourself on the map didn’t take a turn, because it basically didn’t do anything — the whole notion that you occupied a location on the map at all was purely aesthetic, with no effect on gameplay. In DD, your location is sometimes significant: if you use the teleport spell, you can wind up with multiple explored patches, islands in the unrevealed darkness, and you can’t move directly from one such island to another until you’ve explored enough to find a route. Now, when you add newly-revealed tiles to the map, the time spent lets you (and any wounded monsters) heal and regain mana. This is very similar in feel to the way that exploring new area harvests resources in Oasis, right down to the graphical effects that illustrate the resources floating from the revealed tile to the appropriate bins in the UI. But it’s very different strategically. In Oasis, your only motivation for leaving things unexplored is time contraints. DD has no time limit, but does limit how much health and mana you can have at any given time. You can only reap an unexplored tile’s bounty once, so if you’re already at max, exploring new territory is a waste. Darkness is a resource to be hoarded. And that’s in tension with the player’s need to explore for upgrades and, more importantly, for information. Getting a spell glyph can be important enough to burn some darkness. On encountering a shop, you want to know if it’s worth spending all your cash immediately or if there’s a better shop somewhere, and the only way to find out is to go and look for another shop. Finding an altar can be of paramount importance, and is probably the single biggest thing behind the early push to explore. Once you find one, you can declare allegiance to its god, who then rewards you with additional power of some sort in exchange for accepting some kind of limitation. For example, there’s a god of magic that increases your mana limit, but forbids you to use melee attacks — which is not a bad tradeoff if you’re playing a primary spellcaster. Typically, the reward for worshiping a god increases with the number of monsters you fight by the god’s rules, while the limitation remains constant. Thus, you ideally want to find an altar before starting to fight monsters at all. But you can waste a lot of darkness looking for one — there are typically about three per dungeon, but they’re selected at random from a larger set, and you don’t always get an opportunity to worship the god you want. All of which is to say that this is a game that, despite its familiar framework, has interesting rules that create varied gameplay, in which I have to keep learning and figuring things out. It’s so nice to see something like this after what I’ve been playing for the last month and a half.